Akai Professional & Rawcutz are proud to bring you the latest in our MPC Expansion Series sound packs. 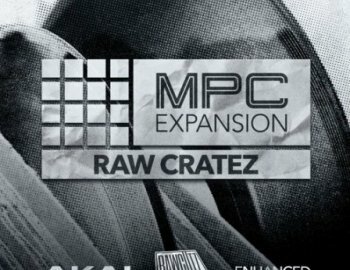 Building upon their highly acclaimed RAWCUTZ Expansion Raw Cratez brings the real essence of this genre inside your MPC. RAWCUTZ are responsible for some of the most prolific sample content available. This Expansion features loosely quantized rhythms, Melodic Keys, Real authentic basslines, soulful chops & stabs, and some of the best sampled drum hits delivering inspiration on all levels, all royalty free and ready to drop into your MPC. This collection was built to inspire and provide building blocks to manipulate, twist and chop to create your own, fresh sound whilst providing access to the sounds of equipment that’s either hard to find, prohibitively expensive or hard to keep working! Raw Cratez gives you instant access to Crunchy Snares, Jazzy Chords and Musical Melodies grouped over 20 inspirational kits of 16 fresh and original samples. Influences in the pack range from the heavy beats of Cypress Hill, with the jazzy instruments of Blue Note, Orbesque atmospherics and husky haunting melodies – all with the trademark RawCutz “pre-worn” sonic treatments. If you are making Deep Golden era Hip Hop, House, Warped beats, Progressive Drum and Bass or Ambient music – you will find inspirational sounds within seconds in this collection of samples created by the original Raw Cutz producer. Includes 1.6 GB of the highest quality one shot sounds and Stabs including Rhodes, Bass, Strings, Vinyl, Keys and more. As usual, Akai, alongside Rawcutz provides you with the best and most uniquely authentic sound set available. Each kit provides you with an excellent selection of samples and patterns that have been expertly programmed to instantly inspire you, no matter what music making mood you’re in.